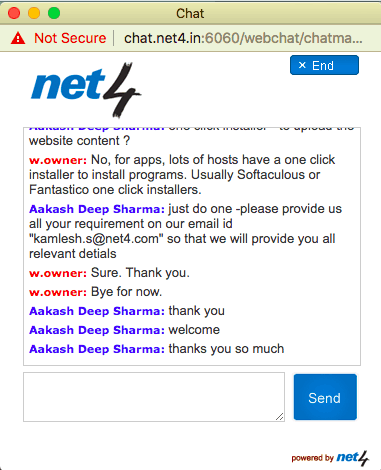 Net4 Review 2019: Is Net4 a Good Hosting? Net4 is a leading Indian web host that provides a full suite of hosting plans with a 99.9% uptime guarantee. Expect to make a major commitment to get the best prices, but be assured that all plans come with a comprehensive range of features and resources. Net4 is one of India’s leading website hosting providers, with 350,000 registered domain names, 80,000 hosted websites, and more than 1.5 million business email customers. It has a modern English language website. Now let’s dig into the data to find out what makes Net4 so popular, and to see if bigger really does mean better. Net4 boasts a solid Indian infrastructure with 15 network Points of Presence (PoPs), seven data centers, and three cloud nodes. The data centers are all ISO-27001 certified to assure an industry-standard 99.9% uptime guarantee. Load balancing ensures you never need to worry about peaks in traffic affecting your website speed. The four types of shared hosting plan are Small Business Owner, Medium Business Owner, Enterprise, and cPanel Hosting. Although bandwidth is unlimited on all plans, you’ll need to upgrade all the way to pricier Enterprise or cPanel plans if you want more than one domain. Aside from the number of domains and the disk space allocations, the features are consistent across all shared plans. They include FTP, MySQL, Microsoft SQL, and your choice of Windows 2008/2012 or Red Hat Linux as the operating system. The Windows plans support ASP and APS.NET whereas the Linux plans support Perl, CGI, cURL, Java, Python, Ruby on Rails, and popular CMS software such as Joomla!, WordPress, and Drupal. Both Windows and Linux come with support for PHP (version 5 rather than the far faster version 7). A website building tool as available as an optional add-on, but despite my best efforts, I couldn’t get customer services to confirm if there was a one-click installer. However, the CMS support suggests there might be. In the main, the prices are very good, with one major caveat. If you need more than one domain, you’ll need to upgrade to the higher-tier plans that get very pricey. However, unlike many hosting companies, this one doesn’t compromise on features when you pick the lower plans. You can purchase the plans in one-year increments from one to ten years, and the monthly fee reduces with the length of the term. A bit of misleading marketing displays the ten-year prices initially, even though I’m not convinced many website owners will want to commit for this long. That’s salesmanship, I suppose. Speaking of sales, you can contact the sales and technical departments by phone or email, and you can even call into the company offices if you happen to find yourself in Bangalore, Chennai, Delhi, Kolkata, Mumbai, or Pune. There’s also a ticketing system for signed-in users, and live chat on the Net4 website, plus online information resources. When I initiated a live chat on a weekday afternoon, the operator picked up quickly and helped me in English. Whilst he couldn’t answer all of my questions, he was very polite and helpful. 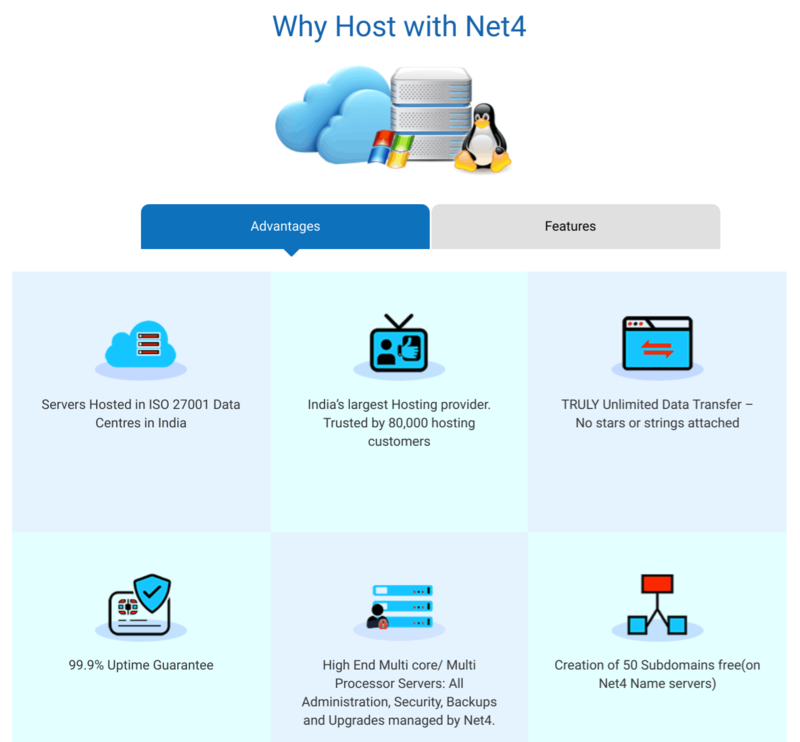 With more than 80,000 hosting customers, Net4 is one of India’s largest hosting providers, so you’d be right to expect a good level of features. And the plans don’t disappoint. For beginners, there’s a website building tool, and for experts, there’s support for advanced programming languages. But to benefit from the best value plans, you’ll need to sign up for an unrealistic ten-year term. Wondering how Net4 stacks up against other Web Hosting companies? Enter any other Web Hosting company and we will give you a side-by-side comparison.